This is the day 6 of our trip and we are going to visit beautiful Pangong lake. Every one in the team was so excited to visit this place and we are going to stay over night adjacent to the lake. 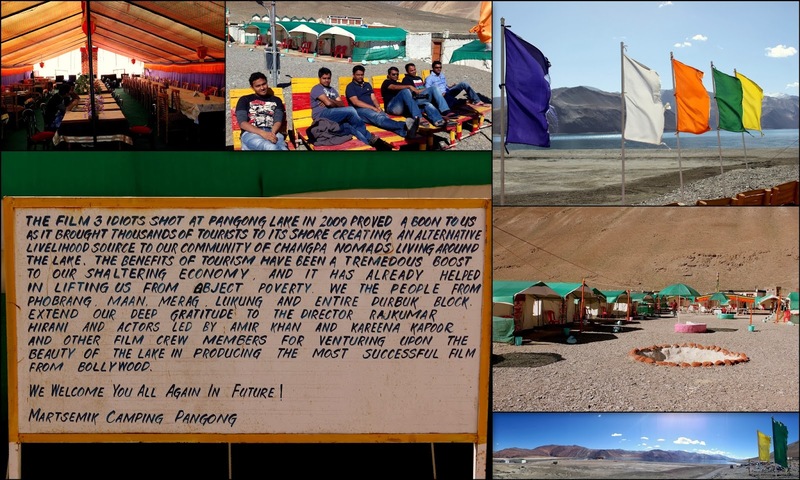 As per the plan, there is no night stay at pangong lake, but we changed the plan and included it. A day before pangong trip, we came to know that there was huge land slide happened near chang la and we were not sure whether we will be going to pangong as per the plan on day 6. 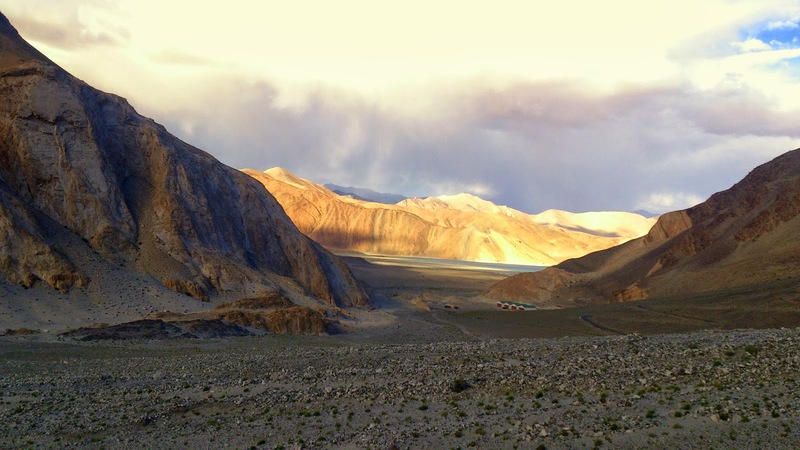 In the morning, our trip manager told us to visit leh palace, sindhu ghat, Thiksey monastery and by that time if the road is cleared, we can go for Pangong lake, but there are just 50 % chances of road to be cleared. Our first stop was at sindhu ghat, which is located just few km from leh market. There is nothing great about this place, but sindhu river has great history associated with it.The Sindhu ( Indus mean sindhu in sanskrit) river originates near Mansarover lake and Mt. Kailash in Tibet enters in to India and flows through the Leh Valley and the enters into Pakistan.The importance of this river to us is it has given our country the name India and people living here are called the Hindu which is the distorted name of Sindhu in the Arab world. The annual Sindhu Darshan festival is celebrated here every June to honor the brave soldiers of this country for their service – apparently participants from various states bring water from their rivers in earthen pots to mix them in the Sindhu river – the mingling symbolizing the multi faceted cultural identity and diversity of this great country. Our next stop was at Shey Palace. Shey used to be summer capital of ladakh. It was built in 16th century. The palace architecture was completely different compared to that of other palaces in India. There is one big Buddha statue inside the palace, which is made up of gold, copper, gems and precious stones. From the palace, you can have good view of Indus valley. Then we visited the famous Rancho School(Druke white lotus school). This school became very famous after the three idiots movie. Climax scenes were shot in this school. The way they are maintaining the school is awesome. This school got many international award for its architecture. It was built in such a way that even in extreme weather conditions, students inside the class rooms wont get effected. During 2010 ladakh cloud burst, the entire school was damaged. 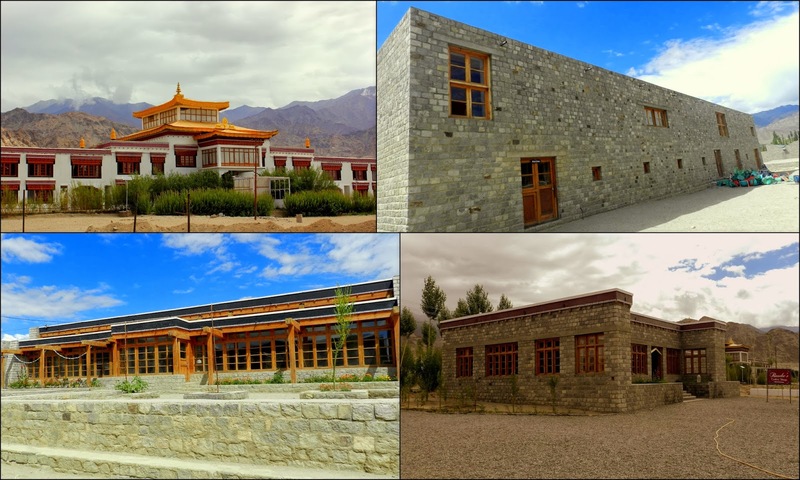 But with the help of amir khan and some corporate people like L&T, they rebuilt the school and presently this is the best school in Ladakh area. 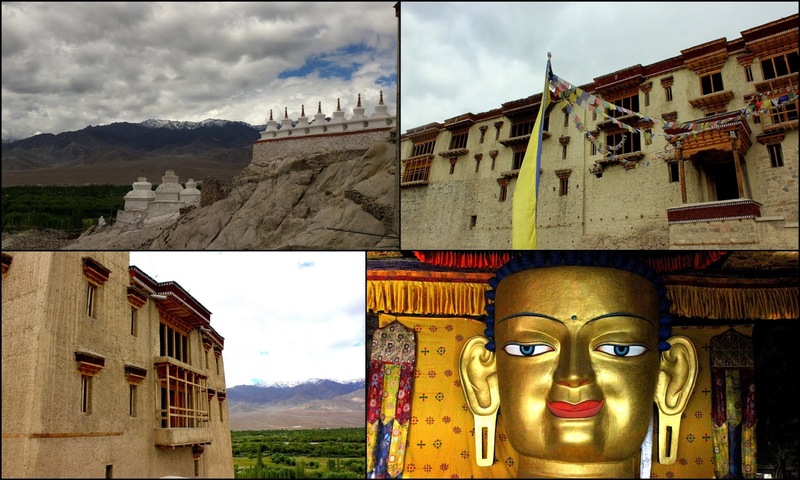 Next we visited Thiksey Monastery, most beautiful monastery in Ladakh area. Maitreyi Buddha located in this monastery is one of the largest statue in Ladakh. Tara temple of Goddess Tara is another major attraction. 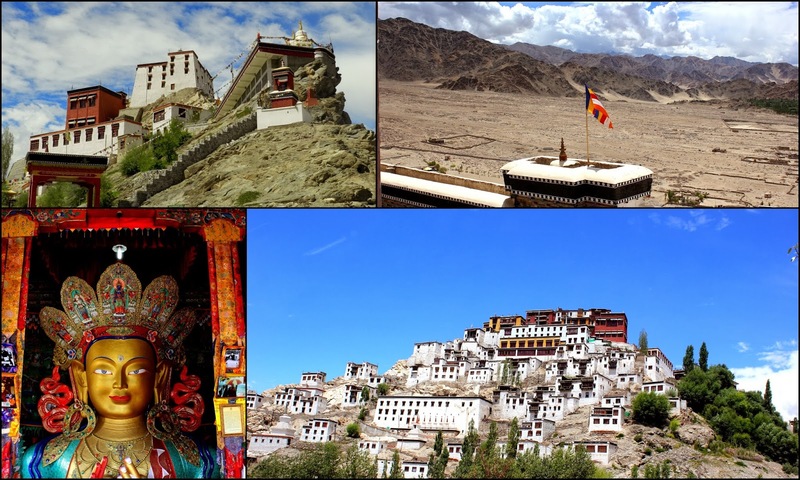 There are many rare and precious stupas, statues, thangkas, wall paintings and swords in the monastery. Views of mountains and surrounding valleys are stunning from top of the monastery. We spend almost 1 hours in the restaurant near the entrance of the monastery, as we didn't get any confirmation about the road status. Even though we didn't any confirmation, we started towards the chang la. We stopped near the army check post where we have to get approval to proceed further. Army officers were not interested to allow us as it was a major land slide and even they don't know when it will be cleared. We lost our hope and started searching for the alternatives, every one was so disappointed. I should really appreciate makemytrip trip manager, I don't remember her name, she tried the maximum to get approval. Finally the deal was set, they allowed us to go till chang la and if the road is cleared by that time we can proceed further, other wise we have to return to ladakh. A huge relief for us, but still not sure whether we will visit pangong lake or not. For the whole day, they allowed only our vehicle to chang la. Road from Karu till chang la was very dangerous with many blind curves. While we are half a distance from chang la, we saw few vehicles crossing chang la, mean the road is cleared. We were so happy and started appreciating our selves that we took right step to proceed to chang la, with our own risk, instead of going back to ladakh. We reached chang la by 1PM, took some rest for 10 mins and started towards pangong lake. We reached the place where the land slide occurred and the road was not completely repaired. We should really appreciate BRO for re-building the road with in one day after the land slide happened. The road from chang la till pangong lake was so picturesque and beautiful. 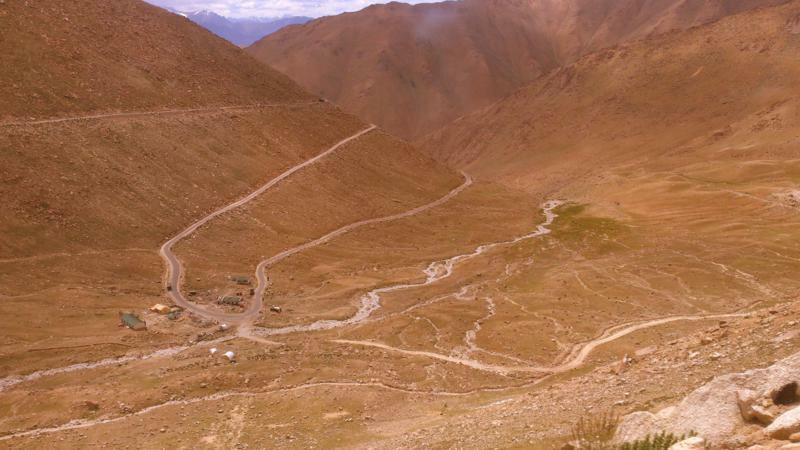 Distance from chang la to Pangong lake is around 100 km and there are just two villages and some army camps on the way. Even though the trip was little hectic, because of the long journeys and bad condition of roads, you won't feel tired because of the beautiful landscapes. When we are about 20 km away from pangong lake, we started waiting for the first view of pangong lake. Finally the first View of Pangong lake, it was amazing. We reached pangong lake by 5 PM and immediately went for having some food. 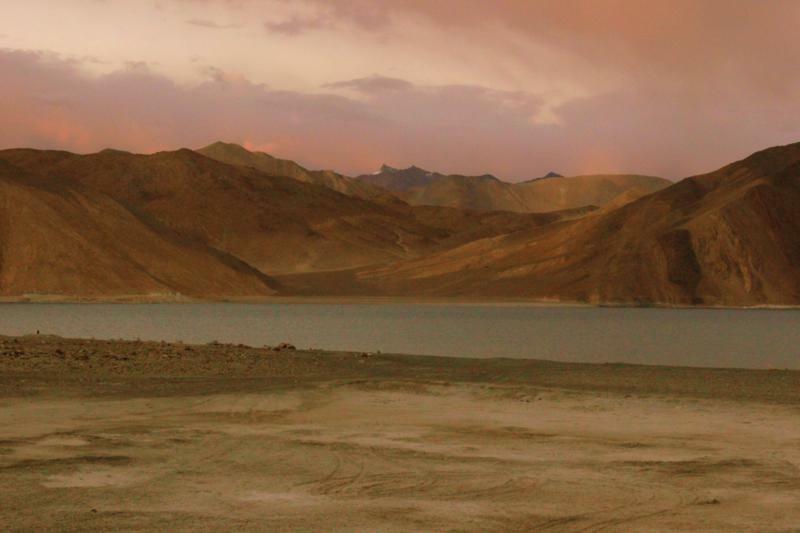 Due to the road block, there was very less people in the pangong lake. There are many tented restaurants serving yummy food near the entrance of the pangong lake. We had some snacks and started searching for the tented accommodation we booked, Martsemik camping. The camping place was too good, much above our expectations, which has 10 tents, restaurant and located just few steps away from lake.The good thing is, every tent has its own wash room. After taking rest for some time, we went towards the lake. The views of lake was stunning. 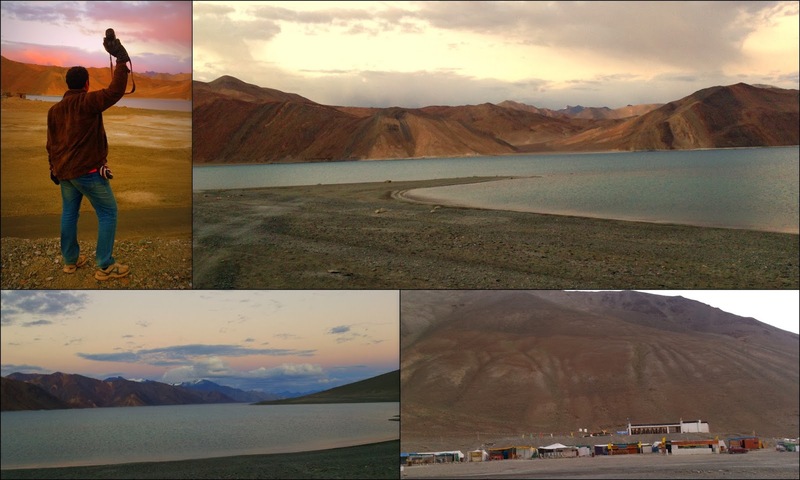 As we reached pangong lake, late in the evening, we didn't get enough time to explore the place. So took some pictures of the lake and went for the dinner. Dinner was arranged in a large tent which has two rooms in it, first room has the dinner buffet spread and the other has restaurant set up. 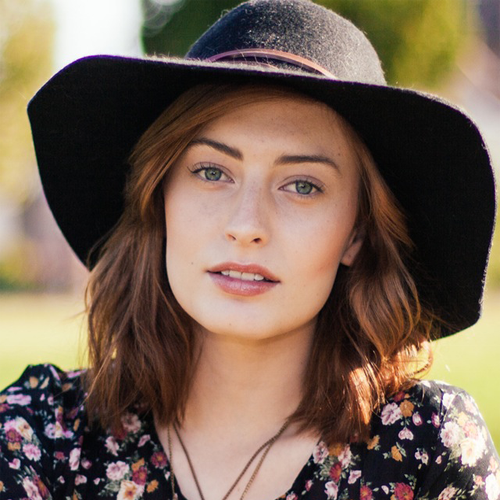 When we enter the first room of the tent, we thought that there was only one room and we started eating there. Later we realized that there is another room and when we open the curtain, we were surprised to see the setup. It is almost similar to the chinese restaurant. Food was too good and we didn't expected such a kind of food and ambiance in the remote place like pangong. We completed dinner by 8PM and went towards the sit out area overlooking the pangong lake. Even though the wind was so heavy, temperature dropped below 5 degrees and faced problems in breathing due to altitude(15k ft), we stayed there till 12PM. It was my best experience till date. It was really a great feeling watching the pangong lake under the moon light. 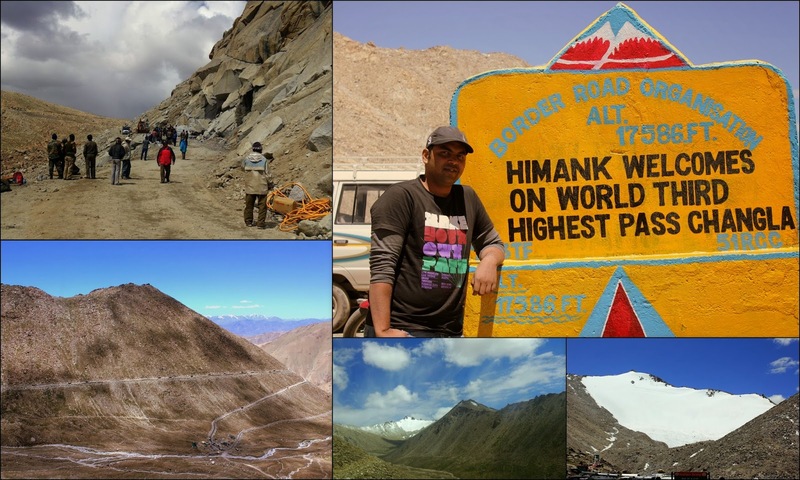 Because of the temperature and altitude, we faced problems in getting sleep, faced problems in breathing too. My sincere advise for those who wants to stay over night at pangong lake is, be prepared for the worst, pack food, medicines and diamox is must. In the night, you require three layers of clothes to with stand the freezing winds.